Strong evidence confirms that two forms of medication maintenance therapy show benefits in treating opioid use disorders, according to literature reviews published in the new issue of Psychiatric Services. 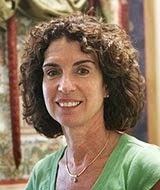 Buprenorphine treatment or a combination of buprenorphine and naloxone “indicated a high level of evidence for its positive impact on treatment retention and illicit opioid use," said Cindy Thomas, Ph.D. (pictured), an associate research professor at the Heller School for Social Policy and Management at Brandeis University, and colleagues. Buprenorphine may be safer than methadone for pregnant women and their newborns, they noted. The treatment may also work as well for patients with prescription opioid dependence as for those dependent on heroin, said the authors. Access may be better, too, since buprenorphine can be prescribed in doctors’ offices rather than only in specialized treatment centers, as is the case withmethadone. Methadone treatment also had significant value in reducing illicit opioid use and in retaining patients in treatment, said Catherine Fullerton, M.D., M.P.H., of Truven Health Analytics in Cambridge, Mass., and colleagues. Evidence for methadone treatment's effects on mortality, drug-related HIV risk behaviors, and criminal activity were less robust but still positive. However, methadone may also present risks for adverse events, including respiratory depression and cardiac arrhythmias. Neither form of treatment appeared to be improved by the incorporation of psychosocial therapies, the authors noted. After reviewing the data, the authors of the studies, which are part of the journal's SAMHSA-sponsored "Assessing the Evidence Base" series, concluded that health officials and policymakers should expand insurance coverage of methadone and buprenorphine maintenance treatments. To read more about buprenorphine treatment, see the Psychiatric News article, "Rule on Dispensing Buprenorphine Eased." For a comprehensive review of the use of medication in addiction treatment, see American Psychiatric Publishing's, Clinical Manual of Addiction Psychopharmacology, Second Edition and APA's website.